Last Thursday I took part in an Author v. Critic panel at the American Society for Criminology’s 41st Annual Conference in Atlanta. The book for which I leniently adopted the title of ‘critic’ was Tore Bjorgo’s “Strategies for Preventing Terrorism”. The premise the book is that terrorist violence is a form of crime and should be treated as such, applying the full repertoires of crime prevention mechanisms and measures. Taking ‘special’ approaches to terrorism frequently just results in creating more problems than they claim to resolve. This is a principle with which I wholeheartedly agreed. After all, the questions we often ask regarding terrorism are the same questions that are axiomatic to those studying crime, specifically those, like myself, who have a background in forensic psychology: who are the offenders, what motivates them, how do they undertake their criminal activity, how can we prevent these behaviors from occurring and, if unsuccessful in doing so, how can we rehabilitate offenders to reduce the risk of recidivism? Picasso and Steve Jobs alike felt that the mark of a great artist was not merely to copy but to outright steal – what follows are three things I propose ‘stealing’ from forensic psychology to apply directly to our understanding of terrorism studies. Marine Ecology judges the similarity of two sites based on not only the co-occurrence of species, but higher taxons of relatedness (e.g. genus, family, etc.). By applying this principle to the linking criminal cases (i.e. that they are not merely compared by the presence of behaviors, but the themes of behaviors they may represent) accurate judgments of the likelihood that 2 crimes share the same perpetrator. So what can we take from this? Well, in the aftermath of any terrorist event a proportion of the discussion is inevitably aimed at determining ‘whodunnit’, and whilst claims are often made based on tactic, target and (sometimes) the ability to make (evidence-based) decisions about the likely perpetrators based on attack information, is of significant operational benefit, especially in places populated by multiple terrorist groups (e.g. Syria). Basing such decisions on behaviors at the attack site itself may suffice, but can also lead to erroneous conclusions (e.g. that Anders Breivik’s first attack was ‘jihadist’ due to its similarities with attacks in wider Europe) but by constructing taxonomic linkage models, which are known to be more robust to situational variability, it may be possible to provide an avenue to more concretely link Modus Operandi to a designated set of perpetrators. Furthermore, police decision-making, especially in the immediate aftermath of a attack often depends upon incomplete data. Taxonomic similarity models of criminal behavior were able to discriminate between linked and unlinked crimes even with up to 50% of the specific behaviors removed. We have increasingly seen non-violent civil protest deteriorate into violence, and in some cases, civil instability. The Extended Social-Identity Model (ESIM) emerged from the research for policing crowds as a theoretical model to describe how a non-violent crowd can become violent. Within crowd psychology, violence emerges as a result of a dyadic inter-group interaction between three factions – the police; the largely un-violent crowd; and the small extremist faction of the crowd attempting to instigate disruption. Whichever collective identify the crowd adopts (either in line with the police, or the extremist faction) determines the normative boundaries for action, and crucially, whether violence will emerge. It is the social relations between these multiple groups that can create the conditions in which extreme ‘hooligan’ action becomes normalized. However, what is important is that it is the actions of both the extremist faction and the police that dictate which side the wider crowd falls on. In these cases, it is the illegitimate police behavior that legitimizes the use of force against them, empowering individuals to engage in physical confrontation. When this happens, the originally neglected ‘out-group’ (the violent, extremist faction within crowd) becomes part of the accepted in-group, dictating the group identify and legitimizing violence. What can we steal from this? We know that the implementation of counter-terrorism strategies may often have had a detrimental effect upon countering-terrorism (CT). One only need consider the influx of IRA recruits after the indiscriminate violence of “Bloody Sunday” in 1972. What ESIM provides is a theoretical construct to better understand the interactions between our CT policies, the psychological mindset of the target audience (whose “hearts and minds” we are often trying to win) and the violent extremists who are equally operating with the equivalent goal. This provides a theoretical backbone to explore how this mindset (and a populations acceptance for both a extremist faction and violence writ large) is shaped and framed by their interactions with us. It also provides a series of case studies where pro-active responses have been implanted, mitigating the emergence of violence (e.g. the policing of football crowds in England, which, if anyone has seen “Green Street”, can actually look like a war zone). The final item on my ‘steal-able’ list was first stolen from 20th century British Philosopher Steven Toulmin. One of the most pervasive parallels between forensic psychology and terrorism research is that both have, unfortunately, had to overcome a negative stigma regarding their early scientific credibility. Early psychological ‘assistance’ to the police often constituted of nothing more that unscientific, unsupported musings, often bound in seductive abstract psychological rhetoric with no investigative utility. But forensic psychology has been able to overcome this stigma of being ‘unscientific’ (thanks in part to the work of Laurence Alison, and Lee Rainbow) and offender profiling is again viewed as an integral part of serious crime investigations. One of the vanguards of this transition was the integration of Toulmin’s philosophy of argument to construct and evaluate expert claims. In fact prior to the 2003, when evaluating 4000 claims that had been used to inform major criminal investigations, nearly 80% were unsubstantiated and less than 31% of the claims were falsifiable. Consider, for example, the murder of a 23 year old female with an accompanying ‘expert’ claim that “the murderer is under 30 years of age’’. 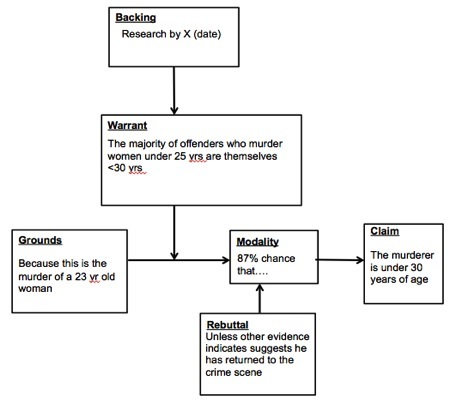 Following Toulmin’s philosophy a concrete argument is one that is warranted and backed by evidence (research by X), provides a ground (why their warrant is applicable to the claim in this case), a modality (degree of confidence we have in our claim) and finally a rebuttal (allowing us to consider the conditions under which the claim ceases to be probable). A complete claim about the offender in this case is depicted in figure 1. So what can we ‘steal’ from this? Well, Andrew Silke highlighted in 2001 how little evidence was originally used in terrorism research, and whilst significant data-driven efforts have occurred since then, unfounded speculation does still occur (especially as we have seen in the aftermath of a terrorist event). 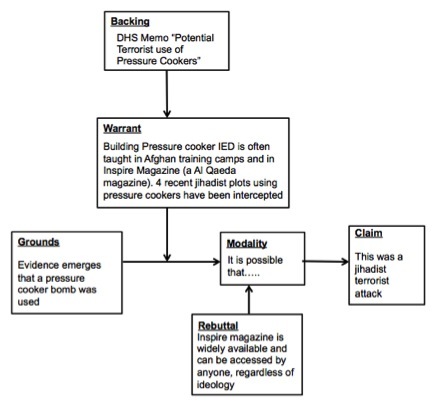 In the aftermath of the Boston Bombing for example speculation abound, by incorporating Toulmin’s philosophy of argument we can see clearly how a series of complete claims could have been made in the early aftermath of the Boston Bombings that articulate the backing or a claim, its evidence, and crucially contain a rebuttal to allow its dismissal in light of new evidence (an example of one such claim is presented below). Borrowing from Toulmin we are able to construct both an approach to evaluate scientific claims regarding terrorism, but also an approach to deliver claims going forward. These are just a few of the many possible theories and approaches that I could have stolen from forensic psychology and I hope to rediscover and re-apply other theories from this field over a series of future blogs. But in the meantime: if you had your wish list of theories to steal from other areas for terrorism studies what would they be? 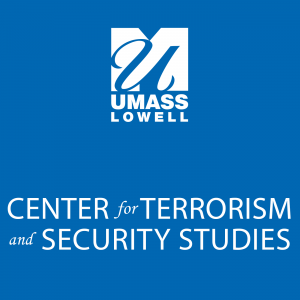 Neil Shortland is a Senior Research Associate at the Center for Terrorism and Security Studies (CTSS) at UMass Lowell. You can find out more about his research here. Little wonder summer seems like a distant memory. I spent June and July chained to my desk for 4 hours (almost) every morning between 7 and 11am. My goal? Finish the heavily revised second edition of my Psychology of Terrorism. One of many lessons I learned from that painful experience is that providing “updates” to a book can be a crushingly dull exercise and in some cases (mine) that process should give way to entire re-writes. We’ll see in March if that strategy pays off – the “Radicalization” chapter was nothing if not an adventure. Anyway, I’m taking a break today from re-writing the final chapter of that book to simultaneously mark the start of a series of blog posts from me for CTSS. 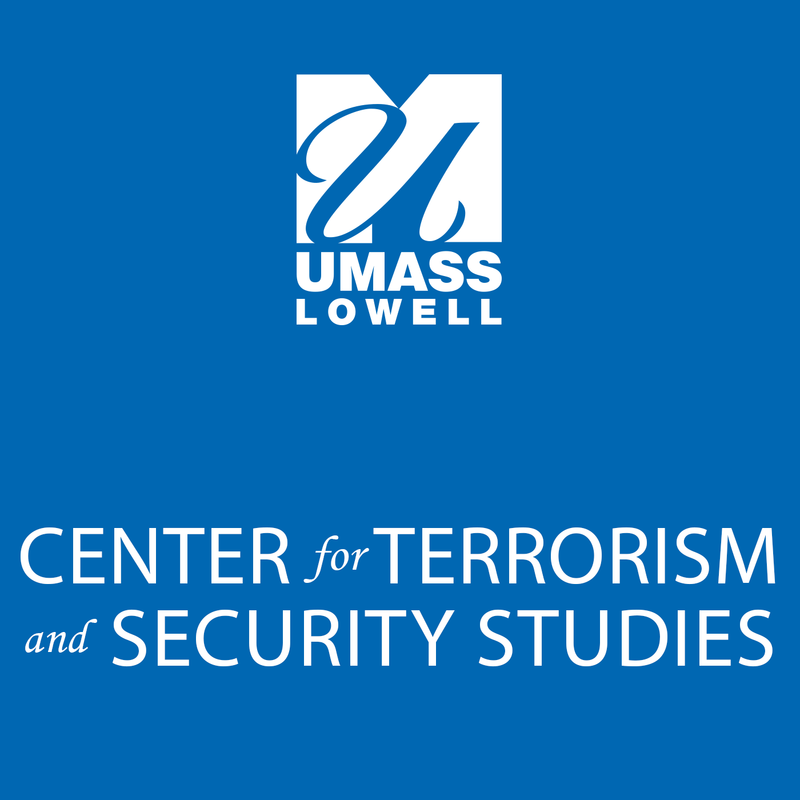 In case you are interested, we are a new center at the University of Massachusetts Lowell and we officially launched about two weeks ago. Amid the important work, we are pushing out a lot of fun stuff too. Stay tuned. For now, I wanted to belatedly (only 4 months!) respond to a Tweet by @zivjeli after I said I had a stack of some 90+ PDFs of terrorism-related articles and reports to sift through back in the early days of summer. She asked me if I’d post a list of them, so here is a kind of response. In one way or another, I drew on about 60-70% of that material in updating the book (amid ongoing research projects that have benefited from that process), but I’ve found myself returning to several pieces in particular, from which I’ve learned a lot. These should not be considered a ‘top’ or ‘best of…’ (though I’ll admit two top ten lists are on the way) – these all just made an impression on me and my thinking about the area. Some are new, some not so new, and others I’ve revisited from a long time ago but dug out to help navigate the current landscape. Inevitably, some of the journal articles listed are ‘gated’ – i.e. you’ll need a journal subscription (or at least your institution will) to access them. Unsurprisingly, a list of only open-access pieces would look different. 1. Bartlett, J. and Miller, C. (2012). ‘The Edge of Violence: Towards Telling the Difference Between Violent and Non-Violent Radicalization.’ Terrorism and Political Violence, 24 (1) 1-21. A serious attempt both to conceptually figure out “radicalization” in its own right as well as to understand its relationship with terrorism. 2. Hegghammer, T. (2012). ‘The recruiter’s dilemma: Signalling and rebel recruitment tactics’. Journal of Peace Research, 50 (1) 3-16. Hegghammer reminds us of our tendency to study the recruits, not the recruiters. He explains why we should turn to the latter to enhance our understanding the process of involvement. 3. Leistedt, S.J. (2013). ‘Behavioural Aspects of Terrorism’. Forensic Science International, 228, 21-27. New to terrorism research? Drowning in the sea of journal articles, books, book chapters, reports? Then look no further. A terrific starting point, especially if rigor and systematic thinking is your thing (hint: it should be). This deserves a little elaboration. If anything has informed the ‘vision’ of many of my recent research projects (if not broader initiatives, both at Penn State and now at UMass Lowell), it’s probably best captured by some of the sentiments expressed in this thought-provoking paper. I read it when it came out in 2004, revisited it in July through a very different mindset and will likely return to it in the future yet again. As research ‘translation’ becomes the long-overdue new normal for anyone who works in this area, this article captures the essence of its importance. And it’s freely available via the link above so no excuses. 5. Thomas Hegghammer. (2013). ‘Should I Stay or Should I Go? Explaining Variation in Western Jihadists’ Choice between Domestic and Foreign Fighting.’ American Political Science Review, February, 1-15. A second entry from Hegghammer and I can safely assume this will have been a very widely read piece. Important for many reasons, including a convincing argument for abandoning the term “homegrown terrorism’. However, this paper is far more significant than that. Hegghammer explores what is commonly accepted in studies of terrorists – they are not all alike – but goes far beyond that in asserting the significance of how and why we should differentiate terrorists. My interest in this piece comes from the perspective of a psychologist interested in understanding how terrorist behavior develops. This is not ‘profiling’ revisited. On the contrary, the arguments Hegghammer makes about the need to differentiate both motivation and behavior goes far beyond that. The folk psychology that characterizes a big chunk of thinking about terrorist motivation would do well to anchor itself in better starting points. Hegghammer provides one, and undoubtedly, many more will follow from this. 6. George Orwell (1938; 2010) Homage to Catalonia (Benediction Classics, Oxford). The first of about a dozen great books I read this year, revisited in light of heightened concerns about the foreign fighter influx into Syria. You can easily find Orwell’s entire text online these days. If you don’t know what this is – it’s Orwell’s autobiographical account of what happened to him as a ‘foreign fighter’ during the Spanish civil war. I first read this, accidentally, as a student in the 1990s, but it has never been more relevant. Read in conjunction with (5) above. 7. Ziad Munson. (2008). The Making of Pro-Life Activists: How Social Mobilization Works (University of Chicago Press). You probably won’t find this on terrorism courses or syllabi yet it is one of the most important books on the nature of mobilization, activism and radicalism. As a terrorism researcher, in exploring the nature of the relationship between radicalization and violent extremism, this book will help you no end. Completely coincidentally, my 2013 book ‘Divided We Stand’ explores several of the same themes not just addressed in Munson’s book as a whole, but especially in Munson’s chapter 6 “United We Stand?” (!). 8. Porter, L.E. and Kebbell, M.R. (2011). ‘Radicalization in Australia: Examining Australia’s Convicted Terrorists.’ Psychiatry, Psychology and Law, 18(2), 212-231. The title is self-explanatory and you’d be unwise to allow it to serve as a factor in your reading list inclusion/exclusion criteria – everyone who studies terrorist behavior should read this. Their results are important and interesting, but read it through till the very end. Only towards the very end of this piece do the authors introduce how individuals in their sample use “neutralization” techniques to legitimize their activities. Despite its profound importance for understanding terrorist psychology, the work of Sykes and Matza from the 1950s rarely creeps into the literature – Porter and Kebbell rectify this and whether intentional or not, open up an entire range of research questions. In search of a PhD topic? Read this article and think about it. One of many non-terrorism focused pieces that, upon reading, sets in motion many connections. Put bluntly – if you want to get creative in your thinking about terrorism – you need to read far more broadly. I was sent this piece by a fellow psychologist and have for the past 3 months explored accounts of involvement in terrorism that touch on similar issues. A fascinating article of immense relevance to exploring the (hypothesized) psychological cost of involvement in terrorism and its implications. Having started my own adventures in terrorism research back in 1995, I’ve seen this field of study mature beyond my hopes. The worst aspects of the ‘terrorism industry’ still thrive, but I’m not talking about that here. The work presented above is scholarship of the highest order. Not all of it would be easily found via a narrower lens of terrorism studies, but those that do (the majority) are hardly a testament to a field in supposed stagnation. There are many additional works that have recently emerged and herein lies the limitation of any attempt to provide a list. This is far more an exercise in recalling pieces that have recently influenced and expanded my thinking about terrorism – nothing more. What articles, books or reports have expanded your thinking about terrorism?